Our 1st quarter market update provides an overview of the real estate activity in early 2018 throughout northwest Vermont (Addison, Chittenden, Franklin, and Grand Isle Counties). Historically, the first 3 months of the year represent the slowest period for sales. With a smaller number of sales, data within this report can be affected in a positive or negative direction without truly representing a trend in the market. Median prices rose for single-family homes in northwest Vermont during the first quarter with Addison and Chittenden Counties showing strong increases. Despite a reported decline in median price, which brought pricing back to 2016 levels, Condos still remain a popular option among purchasers looking for ease of maintenance in their home. The number of condos coming on the market increased as a result of new construction in cities such as South Burlington and Williston. While the number of properties sold dropped year over year, this is a reflection of the limited inventory on the market during the end of 2017 and early 2018. Chittenden County posted an 8% increase in units sold after a weak 1st quarter in 2017. Homes sold in Grand Isle County during the 1st quarter reflect a sharp decline over the same period in 2017. However, the number sold is equal to the same period in 2016. In other words, the strong start for Grand Isle in 2017, with 25 sales, was unusual – and 16 closings in 2018 may not indicate a downward trend for the remainder of the year. Historically, the spring and summer are stronger in this traditionally second home market. While Chittenden County as a whole, posted a healthy increase in median and average sale prices, along with the number of units sold for single-family homes, the story varies city by city. Burlington, Essex, and South Burlington lead the county with 35% – 59% increases in single family homes sold over a very soft 1st quarter of 2017. Condo sales fared well in Burlington and South Burlington as well. The number of condos available for sale in South Burlington increased by 67% over the same time last year – helped along by new projects such as Hillside at O’Brien Farm and South Village. Williston and Milton homes sales slipped year over year, however, with the 1st quarter being the lowest in sales for the entire year, there is still the opportunity to recover as the traditionally busy spring and summer markets heat up. Well maintained properties in desirable locations, priced up to $400,000 are generating multiple offers due to pent-up Buyer demand and low inventory. Buyers and sellers should consult with their agent as to the best strategy for their unique circumstances in order to achieve their real estate goals in 2018. 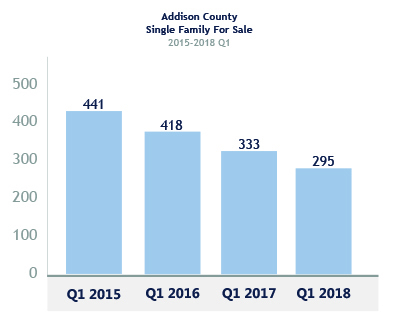 The growth in the median and average sold price for residential property in Addison County continued into the first quarter of 2018. The median price of single-family homes continues to rise year over year while the number of homes for sale hit a five year low. Starksboro, Vergennes, Lincoln and Middlebury lead the county in the number of sales closed – all posting healthy increases in the median sale price of single-family homes. The number of land sales increased by 78% over the 1st quarter of 2017. Home buyers find affordability and options across Franklin County. The number of new properties listed during the start of 2018 has increased, and the total number of homes available to purchase has stabilized. Buyers are finding more home for their money in towns and cities close to Interstate 89 like Fairfax, St. Albans and Swanton– while vacation home purchases are driving median price increases in towns in the northeast part of the county. Buyer interest seems to be heating up in the Luxury market*. While 6 properties sold this quarter compared to 7 during the 1st quarter of 2017, new properties coming on the market are generating multiple showings. With a small number of sales, the “days on the market” (from list to close) fluctuates wildly year over year. 5 of the 6 properties sold so far this year are lakefront properties from Grand Isle down to Ferrisburgh. * The Luxury market is defined as properties selling for $850,000 & above. The multi-family market showed a healthy increase in the median price sold and a big jump in the average price sold – driven largely by some high priced sales in Chittenden County. With 24 closed transactions in Chittenden County during the 1st quarter and only 53 properties available during that time, the market remains competitive for investors. Although the days on the market from list to close increased over the same period last year, this still represents only 3.5 months on the market for closed properties- indicative of a typical “seller’s market”. Newer apartment complexes coming online have eased the historically low vacancy rate in the greater Burlington area a bit, however there is still strong demand from renters. The number of sales for land has increased across Addison and Franklin Counties, where the median price of land is more affordable than nearby Chittenden County. Still, as the availability of single family homes for sale across northwest VT continues at historic lows, buyers are turning toward land purchases in order to build their home. Permitting, development and building costs can contribute to higher than average prices for the home when complete – however buyers benefit from new, energy-efficient and in some cases, custom selections for their home. Developers looking for land in key locations have also contributed to some of increases. Carefree living in an ideal location! Lovely 3 BR split level home on a small cul-de-sac. Open floor plan with large master suite.